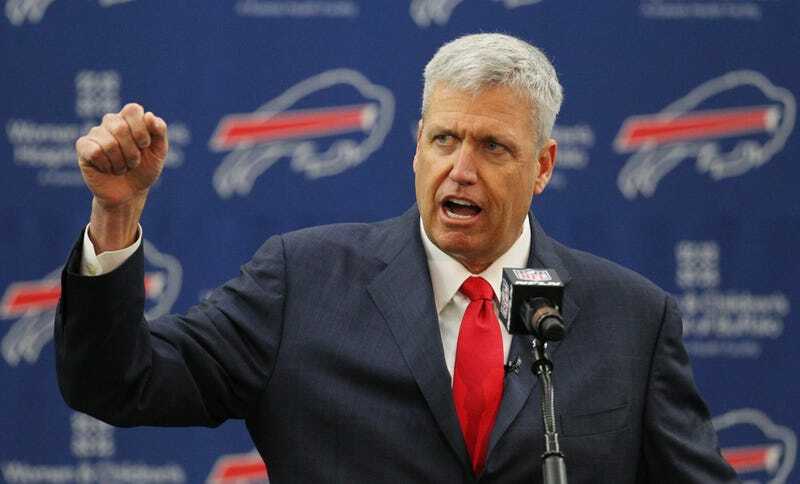 After six seasons with the popgun Jets—four of those with muse Mark Sanchez—lots of folks were surprised that Rex Ryan took a job with the similarly quarterback-challenged Bills, rather than take over the Falcons and Matt Ryan. Asked specifically about it, Ryan says having a QB is NBD. The Bills have E.J. Manuel, who's been pretty not good in parts of two seasons. They do not have Kyle Orton, who retired last month. They also do not have a first-round pick in this year's draft, having sent it to Cleveland to land Sammy Watkins. But in an appearance on PFT live yesterday, Ryan said there's so much more to winning a Super Bowl than throwing the ball. "I've been a part of it, unless you want to say that Trent Dilfer was a franchise quarterback," Ryan said. "You've seen some great defenses in this league win that way but again I just think when you look at it as, 'What's the whole of your team?' I think that's the important thing, and placing all of that pressure on one man, if you have a guy that's not quite at that level, then why would you put all of the burden on him? I think you place it on the entire 53-man roster and then we'll see." We know Ryan cares more about his defenses, and he's already stocked up his staff with a bunch of ex-Jets coaches. But unless he's content with a whole bunch of 13-9 losses, he is eventually going to have to worry about his signal caller. And what do you know? Mark Sanchez is a free agent. "Certainly he'll be a guy under consideration," Ryan said of the Sanchize.